Over the years, I’ve thought a lot about my rules for training that I try to live by. The goal is to have something tangible and useable I can apply during each training session. 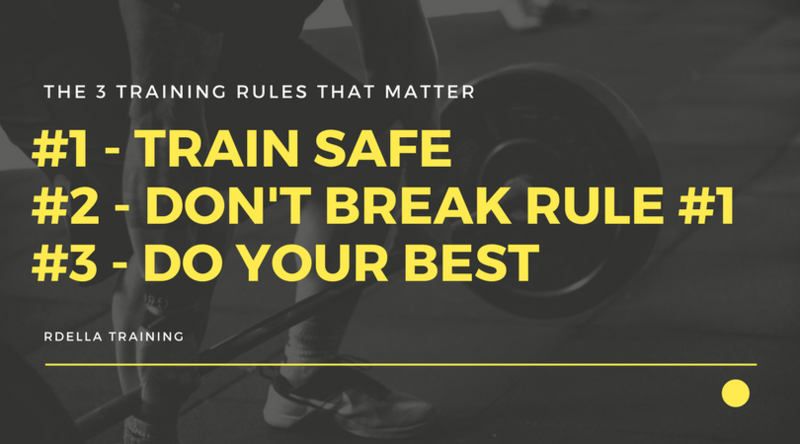 My rules have evolved from many down to 3 simple and unbreakable rules that apply for both short-term and long-term training success. These rules are very basic concepts that allow me to train at a high level over a long period of time, which we could define as high performance. High Performance = training at a high level over a long period of time. Isn’t this the goal of our training? Don’t we all want to train or perform at a high level over a long period of time? I’ve drilled down my training rules to these 3 simple things that I’ll share with you right now. 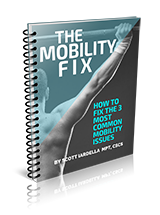 If you apply these simple concepts, I think you’ll find them not only useful, but essential in your training approach – for you or for your athletes. In today’s fitness world, I see a lot of crazy things. I’m sure you do, too. Just today I saw something on instagram and I was like…really? Did I really just see someone post this exercise that’s a major injury in the making? Let’s just say it was extremely unsafe and you’d never catch my doing that particular exercise or technique based on what I know about anatomy, tissue stress, and increased risk for injury. I recently posted this graphic on Instagram, which was a “spot on” quote by one of our favorite coaches, Dan John. Yes, the word “logical” needs to be an important descriptive term when we discuss our approach to training. Every program I write, I always mention rule #1 – which is train safe, no matter what. 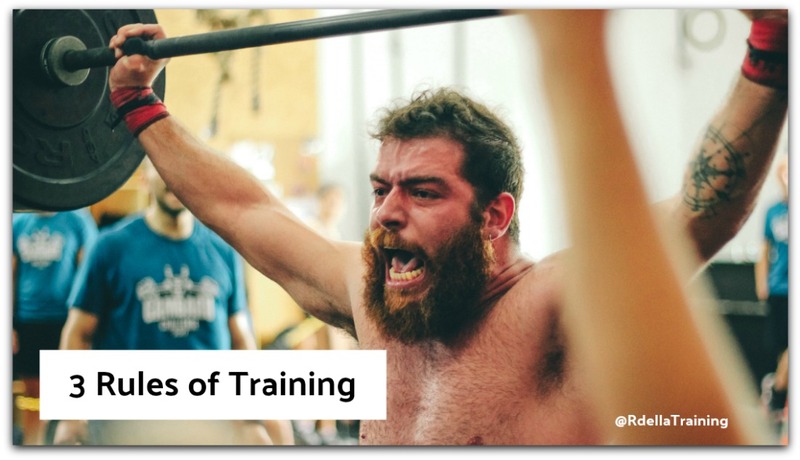 If you get hurt from sloppy training, poor technique, or simply doing “dumb stuff” – you won’t be training for long. I’ve been injured from doing the things I just mentioned, so I’m speaking from personal experience here, folks. Let me get specific for you. Rule #1 is important. Can’t stress this enough. It seems very obvious, but when I see social media – and real world training too – these days, I am reminded how critically important this rule is to reinforce. RULE #2 – DON’T BREAK RULE #1. This rule is simple and reinforces the first rule of lifting. I borrowed this one from legendary investor, Warren Buffet. Buffet has only 2 rules for investing. Rule No. 1 – Never Lose Money. Rule No. 2 – Never Forget Rule No. 1. Remember rule #1 – and don’t violate this rule. RULE #3 – DO YOUR BEST. Let me explain this one a little bit. ‘Do Your Best’ simply means doing your best on any given day. The ‘on any given day’ phrase needs a little explanation. Each day is a different training day, right? Some days you’re going to feel fantastic and be able to do something extraordinary. Others you may be a little tired, distracted, or whatever. Any given training day could be a 5 out of 10 or it could be 10 out of 10 (10 being the absolute best). Your energy may be different, your motivation may be different. Maybe your skill or technique could be ‘off’ during a training session. Do your best with what you have – on that given day. You see the point here? It doesn’t change, you just do your best at each opportunity you have to train. Do the best you can with what you got. Contrary to the popular belief, doing your best doesn’t mean that you have to “crush yourself” into oblivion during each training session. That’s not what I mean. Annihilating yourself and doing your best are two different things, at least from my perspective. Try to get a little better from training session to training session, that’s doing your best. Many times, I’m trying to improve within the training session (from set to set). You could call that intra-session improvement (getting better from set to set). Simple. By working to improve technique or lift efficiency from the previous set. Examples are improving a squat pattern, a hip hinge pattern, using more leg drive, using better muscular tension, focusing on barbell path, or anything else specific that I may be working on that day. There are many things I try to improve on from set to set. Let me tell you this, my friend. You don’t have to have a crushing, ‘PR-setting’ training session every day. Just do your best each day when you step in the gym – perform your best when you’re there. Again, your “best” will vary from session to session. Show up, work hard, and give your training your full focus. Work on progress, not perfection. And, don’t crush yourself. Your best today may be totally different from your best tomorrow. I hope you understand the importance of rule #3. When you show up, do your best no matter how you feel or perform. Commit them to memory (it’s not hard man, it’s just 3 simple things). Most of all, live by them. 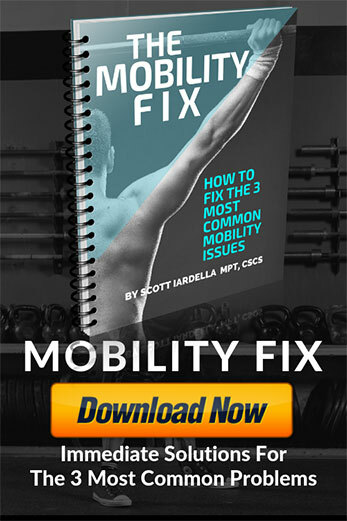 Scott Iardella, MPT, CSCS is a strength coach, athlete, and former “physio” who’s mission is to bridge the gaps in strength, performance and injury prevention. 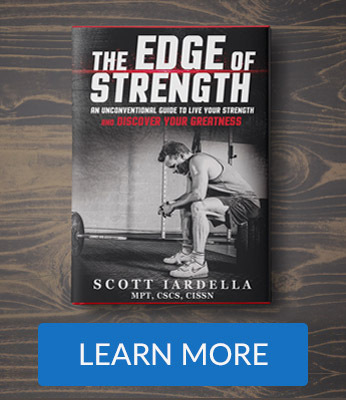 Scott is the author of the book, The Edge of Strength.